Why the sudden Australian foreign policy shift on the matter of Jerusalem? Initially PM Scott Morrison’s captain’s call to move the Australian embassy to Jerusalem was a desperate ploy to garner the Jewish vote in the October Wentworth by-election. The Morrison government was then warned against changes to Australia’s status on Jerusalem by its own Department of Foreign Affairs and Trade, the Defence Department and ASIO. The largest Muslim nation, Indonesia, Australia’s neighbour and largest trading partner, expressed its objection indicating the bilateral defence cooperation commitment may be threatened as well as $16.5 billion free trade (trade with Israel is worth $1.5 billion) agreement under negotiation. At the East Asia Summit in Singapore, Malaysian PM Dr Mahathir’s reasonable prediction that an Australian embassy move was “adding to the cause for terrorism” was met by virulent condemnations of antisemitism by Australia’s Jewish treasurer, Josh Frydenberg. 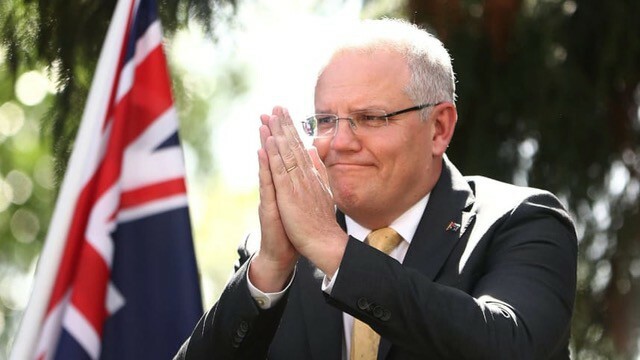 On 11 December, PM Morrison announced that Australia intended to formally recognise Jerusalem as the capital of Israel but, due to a $200 million cost, would delay moving its embassy from Tel Aviv. On 15 December, at the pro-Israel Sydney Institute, Morrison announced a quasi-compromise; it recognised West Jerusalem as Israel’s capital preempting Jerusalem’s status as a corpus separatum to be resolved solely between Palestine and Israel. Repeated slavish adherence to the dead, departed, defunct, belly-up two state solution. The on-cue regurgitation of Israeli official propaganda that Palestine’s resistance movement under Hamas = terror. He stated, ‘the Australian Government has also resolved to acknowledge the aspirations of the Palestinian people for a future state’ but to date Australia has not joined the 137 nations that have recognised the State of Palestine and under Morrison’s direction Australia abstained on UN Resolutions that condemn Israel. It appears that Australian securitypressure has watered down Morrison’s gung ho recognition to only West Jerusalem. On 14 December, the Department of Foreign Affairs warned Australians going to popular Indonesian holiday destinations to “exercise a high degree of caution” recalling PM Mahathir prediction of possible retaliatory terror attacks against Australians. On the bright side, Morrison’s diluted endorsement has unwittingly put his ‘great friend’ in a bind: – of the 610,000 illegal settlers in the West Bank, 215, 000 live in East Jerusalem which was illegally annexed in 1967. That said, what could be moving Morrison to doggedly rush Australia to the edge of a political precipice? A) There is an alarming racist i.e. OK to be whiteJudeo-Christian arrogance underlying the Morrison government that overlooks the religious significance of the Noble Sanctuary in Jerusalem on which stands the third holiest site in Islam where the Prophet Mohammed ascended to heaven for 1.8 billion devoted Muslims, and underestimates their intelligence to see that the Australian ratification of West Jerusalem as Israel’s capital is identical to moving its embassy to Jerusalem and is therefore a political and religious threat. withtheir man, Scott Morrison, who openly identifies as an evangelical and pentecostal member of the The Australian Christian Churches. Pentecostalism is a charismatic evangelical faith. Evangelical Christians take the authority of the Bible as absolute and believe in the fulfilment of”the “prophecy” of the conversion of the Jews, the second coming of Jesus, the final judgment, and the end of the world — the events referred to as the biblical apocalypse” when only believers would rise in Rapture with Jesus to heaven. Unconverted Muslims, Hindus, Buddhists Sikhs, Jews, Athiests, Taoists etc etc will perish in hell. Ideologically, assuming Jesus died to save all humanity, then the essence of Christianity is Agapic equality. So, logically the flaw within the evangelical fulfilment of biblical prophecy is that it is radically exclusive therefore UnChristian. So following on, disrespecting Jerusalem as a Muslim Holy Site and abandoning the political and human rights of Palestinian families to save your own skin is UnChristian, immoral and repugnant (and fantastical). C) Is Morrison rushing through the controversial recognition of the biblical capital because he may only a small window of opportunity before he is likely defeated in the 2019 May election? If religious expedience is a factor overriding the serious consequences of the conservatives’ recognition of Jerusalem as the capital of the Jewish state, then Morrison’s zealousrapture for Jerusalem is challenging the separation of church and state in the Australian democracy, challenging Australian political and economic relationships with neighbouring Asian partners, challenging world peace and may well shake up an Australia’s political apocalypse.